As far as guitar pedals go, there's are probably none more iconic that the Tube Screamer and the Cry Baby Wah. You almost certainly know their sound even you don't necessarily know the pedals themselves. Hendrix. Clapton. Need I say more? In the last month, Ibanez and Jim Dunlop, the companies behind the two pedals have introduced shrunken down versions of the originals. They are adorable. 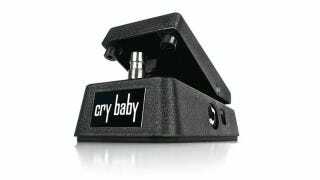 The original design of the Cry Baby Wah as we know it dates to the mid-1960. Dunlop Manufacturing wasn't the first company to produce a rocking foot pedal that makes guitars squeal like a child, but it's one of the most recognizable out there. The new mini version is half the size of the original. Just look at this little guy. According to Dunlop, the new pedal has the same sweep and sonic range of the original. As for the Tube Screamer, the scorching overdrive first appeared in 1979. And yes, for all the gear truthers out there, the new Tube Screamer Mini is actually a variation on a variation. The original was numbered TS-808, while TS9 was later developed for use with solid state amplifiers. Nerds love to debate the difference, but the point is that they're very similar. Below, you have the Tube Screamer Mini next to the TS9. In theory, the circuit from the pedal on the right has been jammed into the more streamlined package on the left.